Ask 'curious' questions and encourage your children to express their feelings. 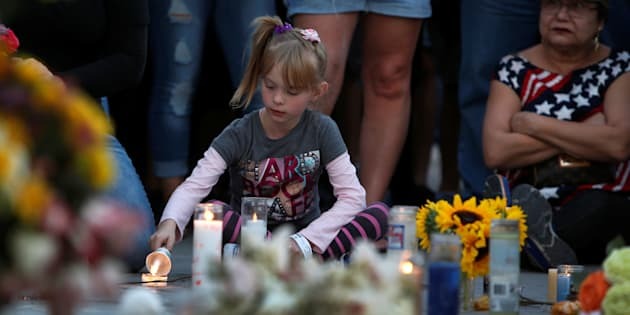 A girl lights a candle at a makeshift memorial during a vigil marking the one-week anniversary of the October 1 mass shooting in Las Vegas, Nevada U.S. October 8, 2017. Devastating events, such as the recent spate of shootings in the United States, can challenge our children's sense of safety in the world. We've all been there. News comes through of a hideous tragedy. A mass shooting. A terrorist attack. It chills us and we get distressed watching the impact of senseless violence on innocent lives. Even worse, we see our children witness it. How do we help them understand such tragedy? And how do we help them (and maybe ourselves) cope with it? As parents, carers or teachers, responding to their questions about these events provides a key opportunity to re-establish a sense of perspective and safety about what youngsters have been exposed to in media reports, images and discussions at school. How can you open up communication with young children and respond to their potential fears? Ask questions to understand what your child knows, and work out how they feel about it. You want to know how they have made sense of it. Ask 'curious' questions and encourage your children to express their feelings, such as "How did this news make you feel?". Create a safe and stable environment in which children can express how they feel, including their fear, with the expectation of a calm and caring response. Validate that whatever their feelings are, they are okay. Don't dismiss their emotional reaction in any way as this may shut down their willingness to communicate, and process the event. "It is okay to say that you feel sad about it. I do too." Children don't usually process what has happened as quickly as adults. It may take time for them to process the event and the questions may take time to come as well -- sometimes days or even weeks. Ultimately, understanding what they know will help you to limit or contain the information you expose them to while answering their questions. What is a 'normal' response? While it's important that children express how they feel about the event, be aware that responses can vary. Some children may worry or cry while others may appear quite numb, simply because it may be too overwhelming or confusing for them. Some children may have difficulties using their words to express their emotions. They might use non-verbal behavioural forms and these can be of concern. They might retreat from activities they would otherwise usually enjoy, or may not want to spend time with family members or friends. A change in attitude and behaviour can signal that your child is struggling to cope. Other signs of difficulties include: sleep problems, physical complaints, developmentally regressive behaviour -- such as thumb-sucking or bed wetting -- behaving immaturely, persistent sadness, depression, anxiety or irritability. Sometimes it can be challenging to determine whether this behaviour is specific to an event. Contacting a GP, psychologist or school psychologist may be helpful if these symptoms are occurring or if your child is struggling to communicate how they're feeling. What do children need to hear from adults? Limit what you share about the event, but don't lie. Be guided by their questions and their current knowledge. For children younger than five, try to shield them from the event and information. For those aged between five and six, limit the detail and separate what is fantasy from reality. It can be useful, for example, to suggest, "Some people were hurt. They are upset. The police are dealing with it. It's sad". For children aged six and upwards, it's best not to flood them with details of what you believe they need to know or assume they know. Instead be guided by their curiosity and level of knowledge. It's important to try and be the first person your children talk to so that you can manage their understanding and perspective. To help them feel safe, ask them what would make them feel safer and remind them that help is being given to those who need it. There is usually a significant focus on the tragic nature of the event, so try to restore a sense of balance and perspective by reminding them about what has recently happened that is good. Children don't need to be directly exposed to an event to be affected by it. Limiting exposure to the media is essential. The repetitive nature of media exposure can intensify the experience and the perceived magnitude of what happened. Maintain a usual routine and engage your children in the activities they enjoy. Dinner, friends, homework, bed time should all be maintained as usual -- spend more time together so that children feel a sense of connection, closeness and safety. A safe and loving environment at home means that children can recognise they have a safe haven at home and are loved. Show empathy for what is happening and give your child a sense of hope through something simple, such as as donating or assisting in some way. This helps them to feel useful rather than hopeless in the face of tragedy.